This fast food* joint changed my life and by "changed my life" I really mean I felt fat and satisfied last night. 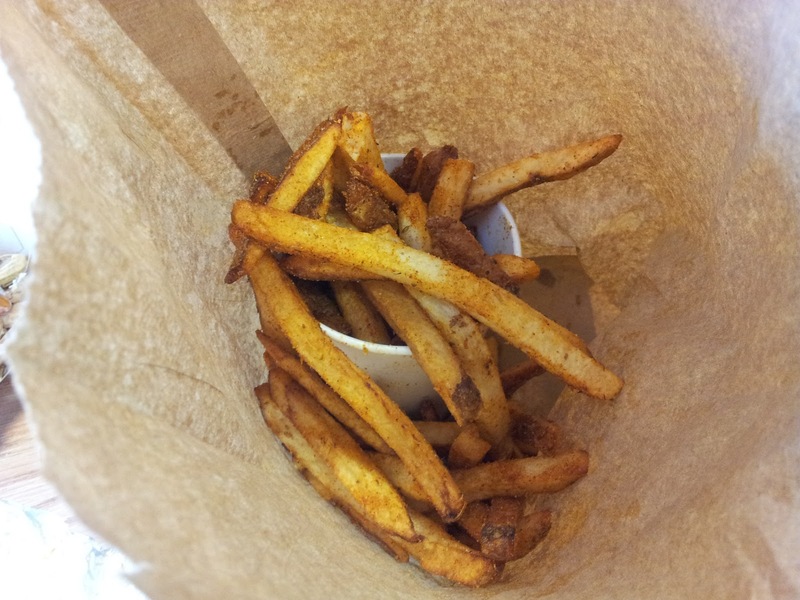 Five Guys Burgers and Fries totally made my week. I visited one yesterday and finished eating some of the fries I had leftover from my meal this morning. On Thursday, I came across this catchy YouTube video of an auto-tuned, songified version of a Five Guys Burgers and Fries meal review. I couldn't stop laughing at the genuine enthusiasm of the reviewer, Daym Drops, and drooling at the close up shots of the food. I wanted to be him so I could eat that food and rave about it in a poetic, glorious, scrumptious manner. If I could talk like him, I'd probably have more friends too. I vowed to myself that the next time I was in the US and I saw a Five Guys Burgers and Fries, I would force them to take my money in exchange for their food. Here's the original review. You should watch it now. If you're feeling hungry, this video will only amplify your hunger pangs. 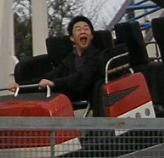 Be warned, Daym's excitement and burger zeal is contagious. Deliciously contagious. I forwarded it to my friend G (not his real name, but definitely a G, yo!) and happened to see him the next day (or in our case, yesterday). We were sharing with each other about how great that song was and how good the food looks, and G casually mentioned at how he knew how Daym felt in his video because he'd eaten Five Guys Burgers and Fries food before. I asked him, "Oh cool, where? When you were in California?" "No, there's one at Park Royal." I know I got really loud because I started to get excited. They have locations in Canada, cool! Long story short, we made a spur of the moment trip to Five Guys Burgers and Fries. Apparently there are many locations in BC and there will soon be locations in Vancouver on Robson and Port Coquitlam. I regret not bringing my camera or Spider-Man. The restaurant was much bigger than I thought it was going to be. Very spacious and bright. It had a diner-eque fast food layout feel. I had a stupid grin on my face as I walked through the door and took in the atmostphere. My stupid grin persisted as I gawked at the menu, placed my order, and waited for our food to be cooked. My stupid grin turned into astonishment when G showed me that they have complimentary salted peanuts (with shell) that you just help yourself to. Free peanuts while you wait! DAYUM! I think we waited for about ten to fifteen minutes before the servers finally called us to pick up our food, hence the asterisk at the top of this post because I'm not sure if that still qualifies as fast*. The staff really took their time in making the burger right so I don't really care about how long I had to wait. I ordered a large fries and a bacon burger with "everything" on it (condiments are no charge: mayo, lettuce, pickles, tomatoes, grilled onions and mushroom, ketchup, mustard). Unfortunately, while waiting for our burgers, we were informed that they were out of bacon (...whaaa? How am I supposed to get my crispety crunch on?) and they gave us free drinks instead. Refills are free. I got refills. I should have asked for cheese in place of bacon, but oh well. More peanuts. NOTE: picture added Sep 10, 2012 - ALSO, this picture doesn't do it justice...and this was only a "Regular"
The burger was wrapped in a foil and it was fat from all the fresh quality condiments they used. It was so tall and uneven from all the toppings that I started to pick out the pickles and tom out the tomatoes (haha) and eat them separately because the height of the burger had to be at least three inches and it was hard to keep everything together. The burger itself was actually made of two patties of juicy, succulent, flat-top grilled, make-your-mouth-water to perfection ground beef. G chided me for picking out the condiments and told me I had to eat it as a whole. He was right, I was not being faithful and true to my burger. I took a huge first bite and I wanted to say "wow!" because it was soooo good (I was also really hungry at this point from all the waiting), but the meat of this strength burger absorbed the air in my mouth and prevented me from talking. All I could do was make muffled delighted "Mmmmm, foo goooth" sounds. Also, the patties were still really hot. The fries were delicious. They use peanut oil to fry their fries (with potato skin still on) so the starchy goodness of the fry retains more oil which I think makes the outer layer darken more and get extra crispy. The fries didn't bite me back as much as I bit them, but there was the perfect amount of salt on them. They were definitely different from Daym's fries in the video. For the record, I got them regular style. Maybe I will try cajun style next time. At this point, my stupid grin was back on my face. G was amused and enjoyed his burger in a quieter, reserved, gentlemanly manner. I took a second, smaller bite while raising my fist to the air and shouted, "...dayum, Dayum, DAYUM!!!!!" 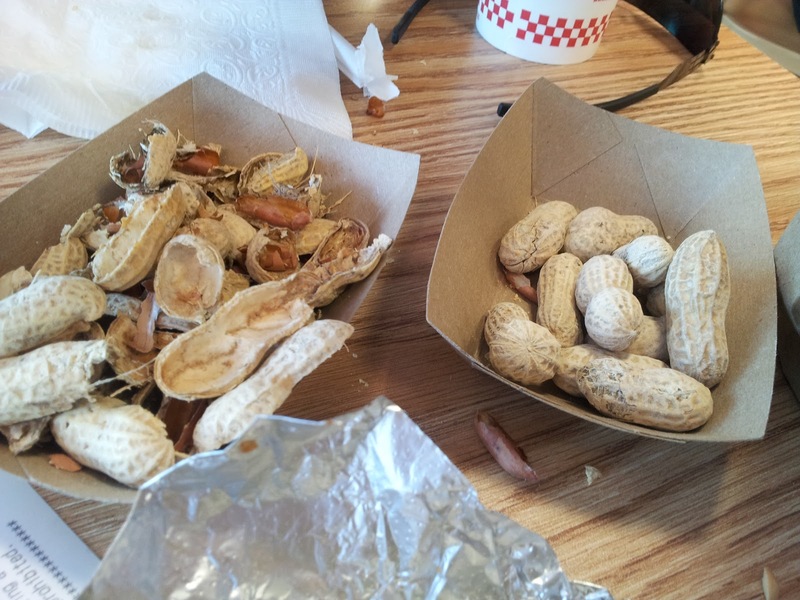 The other patrons and staff in the restaurant stopped to look at me as if I had turned into a giant, salted peanut. Actually, I don't have the guts to do this in real life, but I did whisper "...dayum, Dayum, DAYUM!!!!!" to myself. Did I mention that it tasted really good? 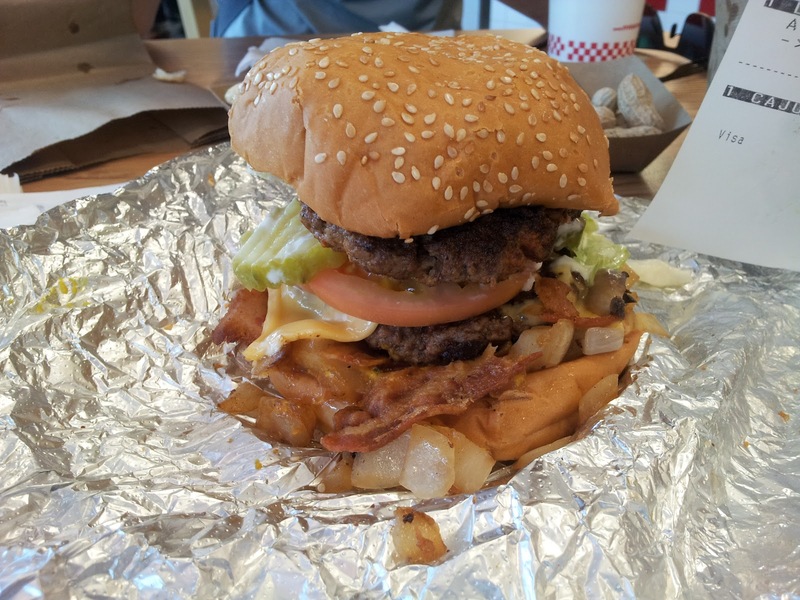 After leaving the Five Guys, I thought about what I paid for and how I could get a Legendary burger with sautéed onions and endless fries at White Spot for $9.99, but Five Guys is different. I will definitely go there again. I paid $7.69 for my "Bacon" Burger and $4.99 for the Large Fries. I think I can do with a single patty next time, which would be considered a "Little Burger" according to their menu. We'll see. When I returned home, my parents asked me typical parent questions such as "Where were you?" and "What did you eat?" so I sat them down and forced them to watch the two videos that I embedded above. They actually enjoyed them! I also raved to them about the food and service as they tried some of my leftover fries, while my Mom reminded me about the dangers of frequently eating out (which I don't do) and eating stuff high in fat. Meanwhile, my Dad nodded in approval at the fries and how good the food looked. Since I forgot my camera, here's a picture of a Big Mac I ate a few years ago, but instead of the middle slice of bread, I replaced it with a Jr. Chicken. Mmm, let's do this! And a tutorial/cover on how to play "Oh My Dayum" by The Gregory Brothers & Daym Drops, yeah!